May 14 (Bloomberg) -- The International Energy Agency cut its oil-demand forecast for a ninth consecutive month, predicting consumption this year will fall the most since 1981 as the recession lingers. The Paris-based adviser to 28 nations cut its global oil demand estimate “slightly” to 83.2 million barrels a day this year, down 3 percent from 2008, it said today in its monthly report. That is 230,000 barrels a day lower than it forecast last month. The revision comes a day after OPEC reduced its 2009 forecast, predicting oil demand of 84.03 million barrels a day. Oil prices have climbed 34 percent this year, trading above $60 in New York this week for the first time in six months on increasing optimism about an economic recovery and record production cuts by the Organization of Petroleum Exporting Countries. Still, U.S. crude stockpiles remain near the highest since 1990 as the recession saps fuel demand. OPEC crude production is beginning to rise as higher prices encourage members to pump more than their quotas. Demand is weakest in the world’s most developed nations, where consumption will drop by 5.1 percent this year, the IEA said. The IEA cited “very weak” demand data in April for the U.S., and to a lesser extent, Europe. Crude inventories in the industrial economies of the Organization for Economic Cooperation and Development are at their highest since 1993, according to Fyfe. Stockpiles were equivalent to 62 days of consumption as of the first quarter of the year, according to the IEA. The energy adviser said it expects consumption in developing economies to contract for the first time since 1994 as China and Russia “continue to exhibit sustained weakness.” Demand in these economies will average 38.1 million barrels a day this year, a decline of 0.4 percent, or 140,000 barrels a day compared with 2008. The IEA demand estimate is based on a forecast that global GDP will shrink 1.4 percent in 2009 and the world economy won’t start to markedly recover until 2010 at the earliest, it said. Should the world economy see “strong” economic recovery this year, the IEA’s oil demand could be “too pessimistic,” according to the group. “If we get an economic bounce in the second half of the year, demand could be stronger than we are showing,” Fyfe said. Non-OPEC supply will fall by 300,000 barrels a day this year, a second annual decline, to about 50.3 barrels a day. The IEA increased its forecast 50,000 barrels a day compared with last month because of “stable” supply from the North Sea and higher-than-expected Russian output. Supply from OPEC rose for the first time in eight months in April as members backtracked on production cuts, according to the IEA. OPEC will meet May 28 in Vienna to review production quotas. It agreed in March to keep supply unchanged as members continue to implement reductions agreed last year, totaling 4.2 million barrels a day, to stem plunging prices. The 11 OPEC nations bound by production quotas pumped 25.8 million barrels of crude oil a day last month, the IEA said, compared with their official Jan. 1 limit of 24.845 million a day. That means the group collectively completed 78 percent of its promised reduction, compared with 83 percent in March, the IEA said. The IEA’s estimate is in line with OPEC’s own figure. The producer group said yesterday the 11 members implemented 77 percent of planned output cuts in April, down from 82 percent for March. Production rose to 25.8 million barrels a day, the group said, citing secondary sources. “There is a little bit of leakage vis-à-vis targets from Iran and a little bit from Angola,” said Fyfe. “Analysts are saying that with prices moving higher and cohesion fraying at the edges, it might be harder” for the group to reduce production again. As global consumption weakens, OPEC needs to provide less oil to balance supply and demand. All 12 OPEC members, including Iraq, will need to supply about 27.9 million barrels of crude a day this year, the IEA report showed. That’s a reduction of 300,000 barrels a day from last month’s assessment. Those same 12 OPEC members pumped 28.2 million barrels a day in April, 270,000 barrels a day more than the previous month, according to the IEA. Crude output in Saudi Arabia, OPEC’s biggest producer, was 7.95 million barrels a day in April, unchanged from March, the IEA said. May 15 (Bloomberg) -- Crude oil traded little changed after rising yesterday as U.S. equities gained and the dollar dropped against the euro, bolstering the appeal of energy futures as an alternative investment. Oil advanced after the Standard & Poor’s 500 Index ended a three-day losing streak. The dollar declined as rising stock prices reduced the need for a refuge. Energy prices fell earlier yesterday when the International Energy Agency forecast the biggest contraction in world oil use since 1981. Crude oil for June delivery traded at $58.55 a barrel, down 7 cents, in after-hours electronic trading on the New York Mercantile Exchange at 8:43 a.m. in Sydney. The contract rose 60 cents, or 1 percent, to $58.62 a barrel yesterday. Prices fell to $56.55 after the IEA report, a four-day low. U.S. stocks advanced on a decline in bank borrowing and better-than-estimated earnings at CA Inc. The S&P 500 Index increased 1 percent to 893.07 and the Dow Jones Industrial Average climbed 0.6 percent to 8,331.32. The dollar was little changed at $1.36 to the euro after declining 0.3 percent yesterday. Oil futures are little changed this week after falling May 13 as weaker-than expected retail data in the U.S. spooked investors. The same day, an Energy Department report showed U.S. crude-oil supplies fell 4.63 million barrels to 370.6 million in the week ended May 8, the first drop since February. The decline left inventories 18 percent higher than the five-year average for the week. Total U.S. daily fuel demand averaged 18.2 million barrels in the four weeks ended May 8, down 7.9 percent from a year earlier, the Energy Department report showed. Gasoline demand averaged 9 million barrels in the same period, down 1.2 percent from a year earlier. The IEA cut its 2009 demand estimate to 83.2 million barrels a day this year, down 3 percent from 2008. That’s 230,000 barrels a day lower than last month’s forecast. OPEC and the U.S. Energy Department lowered their 2009 outlooks this week. The 11 members of the Organization of Petroleum Exporting Countries bound by production targets implemented 77 percent of planned cuts of 4.2 million barrels a day in April, down from a revised 82 percent for March, a monthly report from the group showed this week. OPEC ministers will meet May 28 in Vienna to review the group’s production quotas. Brent crude oil for July settlement was untraded on London’s ICE Futures Europe exchange today. It rose 47 cents, or 0.8 percent, to $58.59 a barrel yesterday. The June contract, which expired yesterday, fell 65 cents, or 1.1 percent, to $56.69 a barrel. May 14 (Bloomberg) -- Gold rose to the highest closing price in seven weeks as investment demand for the metal increased after reports showed a gain in U.S. producer prices and a rise in initial claims for jobless benefits. Silver also advanced. The number of first-time applicants seeking unemployment insurance jumped to 637,000 last week, threatening to restrain consumer spending and prolong the recession. A separate report showed prices paid to U.S. producers climbed in April, paced by a 1.5 percent increase in consumer foods, pushing back the risk of deflation taking root in the economy. Gold futures for June delivery rose $2.50, or 0.3 percent, to $928.40 an ounce on the New York Mercantile Exchange’s Comex division. That’s the highest close for a most-active contract since March 26. Gold probably will trade in a range of $920 to $940 for the next week to 10 days, Platt said. Silver futures for July delivery advanced 2 cents, or 0.1 percent, to $14.04 an ounce. The most-active contract is up 24 percent this year, while gold has gained 5 percent. Initial claims for jobless benefits rose by 32,000 last week, the U.S. Labor Department reported today in Washington. Economists forecast a gain to 610,000 initial jobless claims, the median of 38 estimates in a Bloomberg News survey. The number of U.S. workers collecting unemployment insurance climbed 3.2 percent to 6.56 million in the week ending May 2, the Labor Department said. That set a record for the 15th straight week and shows employers still aren’t hiring. The 0.3 percent increase in U.S. producer-price index last month followed a drop of 1.2 percent in March. Economists projected a rise of 0.2 percent, the median estimate of 68 surveyed by Bloomberg. Excluding fuel and food, so-called core prices rose 0.1 percent. May 15 (Bloomberg) -- The yen fell for a second day against the euro as a gain in U.S. stocks encouraged investors to buy higher-yielding assets with funds borrowed in Japan. The yen weakened against 15 of the 16 most-traded currencies as optimism about a global economic recovery pushed stocks higher and damped demand for safer assets. Gains in the euro may be limited before a European report today that economists say will show the region’s economy contracted at the fastest pace in at least 13 years. The yen declined to 130.84 per euro as of 8:56 a.m. in Tokyo from 130.67 in New York yesterday, paring its weekly gain to 2.6 percent. The dollar traded at 95.98 yen from 95.80. The euro bought $1.3628 from 1.3639. Australia’s currency gained to 72.87 yen from 72.82 as a drop in a gauge of currency volatility reduced the risk of losses from so-called carry trades. JPMorgan Chase & Co.’s index of investor expectations for currency swings, known as implied volatility, fell to 14.39 percent yesterday, from 14.56 percent on May 13. Currency fluctuations can wipe out gains from carry trades, in which investors borrow funds in a country with low interest rates and buy assets where they expect to earn a higher return. Australia’s benchmark lending rate is 3 percent compared with near zero in the U.S. and 0.1 percent in Japan. New Zealand’s official cash rate is 2.5 percent. The Standard & Poor’s 500 Index climbed 1 percent yesterday and the MSCI World Index added 0.1 percent even after a U.S. government report showed first-time claims for unemployment insurance rose more than economists forecast. Initial jobless claims in the U.S. increased to 637,000 in the seven days ended May 9 from 605,000 a week earlier, the Labor Department reported. The median forecast of economists surveyed by Bloomberg was for an advance to 610,000. The euro is still headed for the first weekly drop in three weeks against the yen before a report that economists say will show that gross domestic product in the euro region fell 2 percent in the first quarter from the previous three months, according to a Bloomberg News survey. The European Union’s statistics office will release the report today. The yen was little changed after a government report showed orders for Japanese machinery, an indicator of capital investment in the next three to six months, fell 1.3 percent in March from February, less than the median forecast for a 4.6 percent drop in a Bloomberg survey of economists. FKLI May futures contract fall 18 point lower to close at 1003 as compare to previous trading session with total 7,850 lots traded in the market. FKLI was traded lower due to regional indices plunge together with Dow Jones overnight trading. Technically, FKLI fails to breach 80 – day exponential moving average resistance levels at 1012.5 regions in the hourly while seen break down from 100 – day exponential moving average support levels at 1008 regions. We expect FKLI would trade lower in the coming trading session provided resistance levels at 1007.5 and 1013 were not violated. 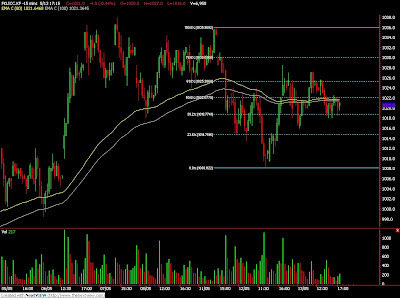 Traders were advice to hold short position while be extra cautious around support levels at 997 and 971 regions. FCPO 3rd month July Futures contract plunge RM105 higher to close at RM2684 as compare to previous trading session with 10,126 lots traded in the market. CPO price was traded lower as soybean oil and crude oil overnight and electronic trading plunge during trading session. Technically, CPO seems complete 361.8% Fibonacci projection at RM2797 region while minor wave seems complete at 161.8% Fibonacci projection. We suggestion CPO price is considered trend reversal based on wave count for medium term basis provided resistance levels at RM2798 and RM2754 must not be violated. Traders were advice to hold short position in the coming trading session while be extra alert around support levels at RM2655 and RM2600 regions. May 13 (Bloomberg) -- The Organization of Petroleum Exporting Countries boosted oil production last month for the first time since July, exceeding its quota by 967,000 barrels a day and backtracking its implementation of supply cuts intended to stem falling prices. The 11 OPEC members bound by targets implemented 77 percent of planned output cuts of 4.2 million barrels a day, down from a revised 82 percent for March, the Vienna-based organization said in a monthly report today. Those 11 nations, which exclude Iraq, pumped 25.812 million barrels a day in April, the report said, citing secondary sources, which include estimates from analysts and news organizations. That compares with 25.587 million a day in March. Those 11 nations have a target of 24.845 million barrels a day that took effect from Jan. 1. Most OPEC nations boosted output during April as oil prices increased to average about $50 a barrel for the month. Crude oil for June delivery traded at $58.67 a barrel on the New York Mercantile Exchange at 2:27 p.m. London time today, having steadily risen from a five-year settlement low of $33.87 on Dec. 19 as the group’s earlier supply cuts took effect. Saudi Arabia, the world’s biggest oil exporter and still the only member to be producing under its target allocation, increased daily output by 20,500 barrels to 7.913 million barrels in April. Its individual quota is 8.051 million barrels a day. Iran, Angola and Venezuela exceeded their quotas the most. Iran pumped 3.75 million barrels a day last month, more than 400,000 barrels a day above its official ceiling of 3.336 million. Venezuela supplied 2.15 million a day, above its OPEC target of 1.986 million a day. Angola produced 1.715 million barrels a day, compared with its target of 1.517 million. The country claims its production quota is higher than the figure assumed by secondary sources, and OPEC itself has declined to clarify the discrepancy by refusing to publish individual country quotas. OPEC meets in Vienna on May 28 to decide oil output policy. At its last summit on March 15 the group decided to leave quotas unchanged as it implemented its existing commitment to restrict supply and as the global recession deepened. Iraq is the only OPEC member not bound by quotas. The monthly OPEC report also revised lower the group’s estimate of world oil demand for a ninth consecutive month. May 14 (Bloomberg) -- Oil fell for a second day after OPEC boosted output for the first time since July and U.S. equities dropped on a report showing that retail sales unexpectedly weakened in April. The Organization of Petroleum Exporting Countries increased oil production last month, exceeding the group’s quota by 967,000 barrels a day. Stocks fell in the U.S., the world’s largest oil-consuming nation, after the Commerce Department said that purchases at stores decreased 0.4 percent. Crude oil for June delivery dropped 35 cents, or 0.6 percent, to $57.67 a barrel on the New York Mercantile Exchange at 9:18 a.m. in Sydney. Yesterday, the contract fell 83 cents, or 1.4 percent, to settle at $58.02 a barrel. It was the biggest decline since April 27. Prices initially rose after an Energy Department report showed that U.S. supplies dropped for the first time in 10 weeks. Oil touched $60.08 on May 12, a six-month high. The Standard & Poor’s 500 Index declined 2.7 percent to 883.92 and the Dow Jones Industrial Average dropped 2.2 percent to 8,284.89. Economists forecast that the Commerce Department report would show that retail sales were unchanged, according to the median of 67 projections in a Bloomberg News survey. The 11 OPEC members bound by targets implemented 77 percent of planned output cuts of 4.2 million barrels a day, down from a revised 82 percent for March, the Vienna-based organization said in a monthly report yesterday. The 12-member group will take into consideration the recent increase in oil prices when it meets on May 28 to decide whether a cut in output is needed to support prices, said Shokri Ghanem, the chairman of Libya’s National Oil Corp.
Oil prices are up 30 percent this year, supported by record production cuts announced by OPEC at three meetings in 2009. Total U.S. daily fuel demand averaged 18.2 million barrels in the four weeks ended May 8, down 7.9 percent from a year earlier, the Energy Department report showed. Deliveries of petroleum products, a measure of consumption, averaged 19.1 million barrels a day from the beginning of the year through April, 4 percent less than during the same period in 2008, according to a report yesterday from the industry- funded American Petroleum Institute. Fuel use was the lowest for the first four months of the year in 11 years. OPEC cut its 2009 demand forecast for the ninth straight month, according to a monthly report from the Vienna-based group. Consumption will contract by 1.57 million barrels a day this year, or 1.8 percent, to 84.03 million barrels, OPEC said yesterday. That’s 150,000 barrels lower than the April forecast. U.S. crude-oil supplies dropped 4.63 million barrels to 370.6 million in the week ended May 8, the Energy Department said. Stockpiles were forecast to increase by 1 million barrels, according to the median of responses in a Bloomberg News survey. Gasoline inventories fell 4.15 million barrels to 208.3 million in the week ended May 8, the Energy Department report showed. The 16 analysts surveyed by Bloomberg news before the report were split over whether stockpiles of the motor fuel would rise or fall. Gasoline futures for June delivery rose 2.09 cents, or 1.3 percent, to settle at $1.6888 a gallon in New York. Brent crude oil for June settlement fell 60 cents, or 1 percent, to end the session at $57.34 a barrel on London’s ICE Futures Europe exchange. May 13 (Bloomberg) -- Soybeans rose for a fourth straight session, touching a seven-month high, on forecasts that U.S. stockpiles are heading to a five-year low because of increased exports to China. Inventories on Aug. 31, before the harvest, will drop to 130 million bushels from 205 million a year earlier, the U.S. Department of Agriculture said yesterday. The National Weather Service says as much as 4 inches (10 centimeters) of rain will saturate eastern Midwest fields in the next five days, which may further delay seeding. The USDA said 14 percent of the crop was sown as of May 10, behind the five-year average of 25 percent. Soybean futures for July delivery rose 10.5 cents, or 0.9 percent, to $11.28 a bushel on the Chicago Board of Trade, after earlier rising to $11.41, the highest since Sept. 29. The most- active contract has surged 35 percent from an 11-week low on March 2. Estimated global production this year will fall to 212.8 million metric tons, compared with 218.8 million forecast a month ago and a record 221.1 million harvested last year, because of smaller crops in South America, the USDA said yesterday. Global consumption this year is forecast at 222.5 million tons, compared with 225.4 million projected in April. Inventories on Oct. 1, before the Northern Hemisphere harvest, will fall to 42.6 million tons from 53.1 million last year, the USDA said. May 14 (Bloomberg) -- The yen rose for a fourth day against the euro and the dollar strengthened after an unexpected drop in U.S. retail sales spurred demand for the relative safety of the Japanese and U.S. currencies. The euro fell to a two-week low versus the yen after Marko Kranjec, a European Central Bank council member, said the bank is likely to increase its asset-purchase program and may broaden the scope beyond covered bonds. The Australian and New Zealand dollars traded near the lowest in a week as Asian stocks extended a global slump, raising concern demand for higher- yielding assets will evaporate. The yen advanced to 129.20 per euro at 9:01 a.m. in Tokyo from 129.61 in New York yesterday. It earlier reached 128.87, the strongest since April 29. The dollar gained to $1.3544 per euro from $1.3600 yesterday. The yen traded at 95.38 against the dollar from 95.30. Australia’s currency traded at 75.32 U.S. cents after falling as low as 75.16 cents, approaching its lowest since May 8. The Nikkei 225 Stock Average fell 1.3 percent after the Standard & Poor’s 500 Index lost 2.7 percent yesterday. U.S. retail sales decreased 0.4 percent in April after dropping a revised 1.3 percent in March, the Commerce Department reported yesterday in Washington. The median forecast of economists surveyed by Bloomberg was for no change. FKLI May futures contract fall marginally 4.5 point lower to close at 1021 as compare to previous trading session with total 6,958 lots traded in the market. Unlike previous trading days, yesterday trading session was traded sideways throughout entire trading session due to mixture of important indices between Hang Seng index and Dow Jones electronic trading. 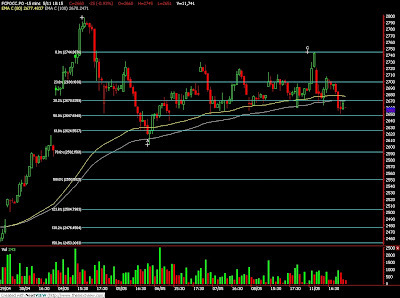 Technically, FKLI seems was traded sideways throughout entire trading session within 1027 to 1016 regions. FKLI seems topped around 61.8% Fibonacci levels at 1025 while manage to close above 80 – day and 100 – day exponential moving average in the 15 min chart. We expect FKLI would trade lower in the coming trading session provided resistance levels at 1028 and 1037 were not violated. Traders were advice to hold short position while be extra cautious around support levels at 1010 and 1000 regions. FCPO 3rd month July Futures contract surge RM64 higher to close at RM2789 as compare to previous trading session with 11,511 lots traded in the market. CPO price was traded higher during trading session due to strong soybean oil and crude oil electronic trading. Technically, CPO price seems manage to breach sideways trading range at RM2730 to RM2650 region and tested previous high levels at RM2798 regions. We expect CPO price would trade higher in the coming trading session provided it breaks resistance levels at RM2798 and RM2830 regions. 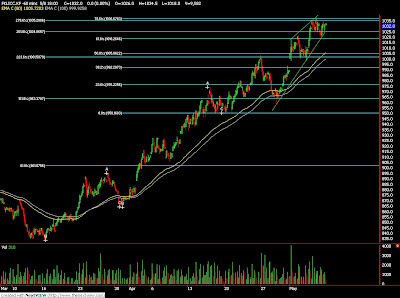 However, we expect CPO price might trade on the high side as bull rally have been continue for more than 2 months. 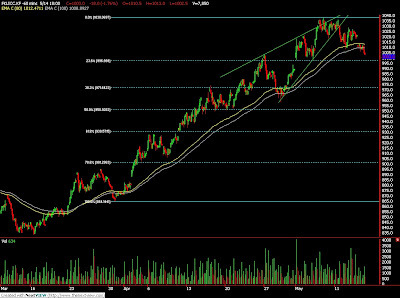 Traders were advice to hold long cautiously while be extra cautious around support levels at RM2740 and RM2650 regions. NEW DELHI, May 13 (Reuters) - India's edible oil imports in April doubled to 659,477 tonnes from a year ago, slightly higher than forecasts, as domestic demand rose and local oilseed output was lower than expectations, a leading trade body said. April imports were 8.2 percent higher than March, while stocks were equivalent of one month's imports, lower than expected, the Solvent Extractors' Association of India (SEA) said on Wednesday. Vegetable oil imports in April rose to 699,396 tonnes, twice as much as a year ago and were likely to be in the range of 650,000-700,000 tonnes a month for the next six months, it said. Imports of vegetable oils in the first half of oil year that began last November rose to 4.3 million tonnes from 2.6 million tonnes a year earlier, due to friendlier tax regime. "Palm products have appreciated by about $250 since November, still with nil duty is attractive," said B.V. Mehta, executive director of the trade body. In April, palm oil imports stood at 555,872 tonnes, including 431,637 tonnes of the crude palm oil, which was 46 percent higher than a year earlier. Crude soyoil imports stood at 26,206 tonnes, lower than 46,346 tonnes imported in March. Imports of sunflower oil also came down to 66,730 tonnes from 84,120 tonnes in the previous month. Non-edible imports were at 39,919 tonnes in April against 37,703 tonnes a year ago. BEIJING/BRUSSELS May 12 (Reuters) - Chinese exports dropped sharply and a clutch of Japanese companies registered hefty losses on Tuesday, while central banks expressed some optimism that the worst was over for the world economy. Banks, the epicentre of the financial crisis, continued to hold the markets' focus with Bank of America rising over $7 billion and the European Union saying it would follow Washington's lead and conduct tests on its banking sector. A bigger than expected 22.6 percent annual fall in Chinese April exports showed global demand remained subdued at best, with Japanese exporters continuing to suffer. SINGAPORE, May 12 (Reuters) - Chicago soy and corn futures were almost flat in thin trade as investors awaited a crucial U.S. supply and demand report. Analysts said the soy market could come under some pressure on talk that China is slowing imports of the oilseed after buying record quantities in recent months that propelled prices to a seven-month top last week. SYDNEY, May 12 (Reuters) - An unseasonally dry autumn so far has ruled out a bumper grains crop in Australia's top exporting state of Western Australia, grains handler CBH Group said on Tuesday. "The long-range forecast is not very good, it's still very hot in Western Australia," CBH's general manager of operations Colin Tutt told Reuters. NEW DELHI, May 12 (Reuters) - India has revised up its expected grains output in the crop year ending June by 0.9 percent to 229.85 million tonnes from a February forecast of 227.88 million tonnes, a government website showed on Tuesday. Wheat output in India, the world's second-biggest producer, was expected at 77.63 million tonnes, down slightly from 77.78 million tonnes estimated in February. KUALA LUMPUR, May 12 (Reuters) - Malaysian palm futures surged 2.4 percent to a one-week top on fears of hot dry weather cutting into production and traders taking positions ahead of a crucial U.S. soy report. "Output is a worry, it might be due to the current hot weather," said a trader with a local commodities brokerage. BEIJING, May 12 (Reuters) - China expects soybean imports in May to reach 3.66 million tonnes, the latest estimate by China's commerce ministry showed on Tuesday. The figure was lower than estimated by traders at between 4 to 5 million tonnes. The ministry's estimate was in line with actual arrivals for April, which rose 55.2 percent on year to 3.71 million tonnes, according to China's customs. Beijing's stockpiling of domestic soybean had led crushers to shift to cheap imports. KUALA LUMPUR, May 12 (Reuters) - Palm oil output in Malaysia will struggle to rise in the next few months and may not even hit strong double-digit peaks this year as the current hot and dry weather hurts yields, plantation officials said on Tuesday. Production in the world's second-largest supplier of the vegetable oil will register marginal growth until September or October where the increase may only be above 5 percent compared to double-digit growth in previous years. NEW DELHI, May 12 (Reuters) - The European Union may ban groundnut imports from India due to the presence of aflatoxin, a fungus, the Business Standard reported on Tuesday, citing the head of an industry body. A European delegation would visit India in September to check quality standards and if processing units fail to meet European standards, imports from India might be banned, Sanjay Shah, chairman of the Indian Oilseeds and Produce Export Promotion Council told the newspaper. LONDON, May 12 (Reuters) - Raw sugar futures touched another near three-year high on investor buying, and coffee edged up, helped a weaker dollar, with arabica traders focused on a Colombian supply shortage, dealers said. A global sugar deficit of 7.5 million to 7.8 million tonnes is expected in 2008/09, up from a previous estimate of a 4.3 million tonne shortfall, the International Sugar Organization said on Monday. ABIDJAN, May 12 (Reuters) - Persistent heavy rainfall in some Ivorian cocoa growing regions last week, after several weeks of humid conditions, increased the risk of black pod disease outbreaks in cocoa plantations, farmers and analysts said on Tuesday. Black pod disease, which thrives in the wet, blighted the October-March main crop in the world's biggest grower. KUALA LUMPUR, May 12 (Reuters) - The International Cocoa Organization (ICCO) revised down Indonesia's cocoa output to "well below" 500,000 tonnes in the crop year to September 2009 due to poor maintenance, its chief Jan Vingerhoets told Reuters on Tuesday. The ICCO had pegged Indonesia's output at 510,000 tonnes in its February estimates. KUALA LUMPUR, May 12 (Reuters) - Cocoa powder from Malaysia was sold at $3,000 a tonne for nearby shipment, its highest level since 2001, suggesting that demand for the product was steady even while grinders in Asia struggle to sell butter during the economic meltdown, industry sources said on Tuesday. Indonesian cocoa powder was also traded recently at above $2,000 a tonne to buyers in South America, but there were no details on quantity. Powder is used in coating in chocolate manufacturing and beverages, while butter is the key ingredient for making chocolates. JAKARTA, May 12 (Reuters) - Indonesia, the world's sixth-biggest soybean importer, may buy 1.16 million tonnes of soybean this year, down about 6 percent from 2008, on higher domestic output, an industry official said on Tuesday. "Indonesia's soybean demand may grow 2-3 percent this year but we don't expect imports to rise because of higher domestic harvests," Ali Basry, director of the Indonesian representative office of the American Soybean Association - International Marketing, said in an interview with Reuters. May 12 (Bloomberg) -- Quantum Energy Partners, the Houston private-equity firm that put together a $3.5 billion bankroll to go bargain-hunting for acquisitions after oil and natural-gas prices plunged, is waiting for a better time to pounce. Buyers will accelerate acquisitions late this year and in early 2010 as the hedging contracts that shielded potential takeover targets from tumbling prices expire, said Wil VanLoh, Quantum’s chief executive officer. The record drop in crude prices from 2008’s all-time high hasn’t triggered a surge in takeovers because would-be sellers are demanding mid-2008 valuations, said Michael Bodino, director of research at Sanders Morris Harris Inc. in Dallas. That will change, Bodino and VanLoh said, as hedging contracts drop off, forcing the weakest producers to sell or face bankruptcy. The number of oil and gas deals last month fell 35 percent from a year earlier, and the value of transactions dropped 60 percent to $5 billion, according to data compiled by Bloomberg. UTS Energy Corp. of Calgary repulsed a third and final takeover bid of C$830 million ($680 million) by Total SA last month, saying the company is worth more. “Now is not a good time to buy because sellers have unrealistically high price expectations,” said Michael Harness, chief executive officer at Osyka Corp., a closely held oil producer in Houston. Harness, a former Amoco Corp. engineer, expects expiring hedges to begin forcing rivals to put oil and gas fields on the auction block as soon as July. Producers that pre-sold their September 2009 output a year ago locked in a price of $106 a barrel, based on New York Mercantile Exchange futures. If that’s the last month for which they have hedges in place, the best they can hope to get for October production is $58 a barrel, or 45 percent less. At Quantum, VanLoh and co-founder Toby Neugebauer gathered the managers of their portfolio companies last month to order a halt to acquisition activities on expectations that asset prices will decline more. Quantum has invested in 23 companies that later were sold or went public. The firm staked Linn Energy LLC with $15 million in 2003 and took the partnership public in 2006. Houston-based Linn has a market value of more than $2 billion today. In the Canadian province of Alberta, home to an oil industry that five years ago surpassed Saudi Arabia as the biggest crude exporter to the U.S., cratering stock values and lower energy prices have prompted the C$70 billion ($61 billion) Alberta Investment Management Corp. to step up the search for investment opportunities. “With commodity prices where they are now, Alberta is looking like it’s going to present a lot of opportunities for us,” Chief Operating Officer Jagdeep Singh Bachher said in a telephone interview. Edmonton-based AIMCO, as the Crown corporation is known, agreed last month to acquire a 20 percent stake in Calgary-based Precision Drilling Trust, Canada’s largest oil driller. AIMCO’s next move will be to sift through the market wreckage and find companies with assets and management teams most likely to excel even if energy prices remain depressed, said Brian Gibson, senior vice president for public equities at AIMCO. Major U.S. oil producers such as Irving, Texas-based Exxon Mobil Corp. have said smaller producers and their fields are either too overpriced or too marginal to acquire. Exxon Mobil had $25 billion in cash as of March 31. Chevron Corp., the second-biggest U.S. oil company, had more than $9 billion. Exxon Mobil’s top priorities for use of its cash are capital projects, dividends and stock buybacks, David Rosenthal, vice president of investor relations, told investors on an April 30 conference call. New York-based Hess Corp., the No. 5 U.S. oil producer, said it hasn’t found any assets for sale that are worthy of tapping its $1.16 billion cash reserve, which will help fund exploration prospects off the coasts of Brazil and Australia. Osyka, an owner of oil and gas wells in Texas and Louisiana that emerged from bankruptcy last year, is looking for assets in the $10 million to $50 million price range to add reserves and production, Harness said in an interview. Canada’s Nexen Inc. isn’t finding companies worth buying because it’s seeing mostly assets that require $80-a-barrel oil prices to be viable, Chief Executive Officer Marvin Romanow said in a May 8 interview at the company’s Calgary headquarters. “While we’re always on the lookout for acquisition opportunities, the situations we’ve looked at during this price collapse involved challenging assets with challenging financing,” Romanow said. May 13 (Bloomberg) -- Oil rose for a second day after China, the world’s second-biggest energy-consuming country, said yesterday crude imports increased by 14 percent in April. Deliveries reached 16.17 million metric tons last month, or 3.9 million barrels a day, the Chinese customs department reported. Oil also climbed as the dollar fell to the lowest level against the euro since March, bolstering demand for commodities as an alternative investment. Crude oil for June delivery rose as much as 69 cents, or 1.2 percent, to $59.54 a barrel, and traded at $59.50 on the New York Mercantile Exchange at 8:47 a.m. in Sydney. Yesterday, the contract rose as much as $1.58, or 2.7 percent, to $60.08 a barrel before settling at $58.85 a barrel, the highest settlement since Nov. 11. China will increase imports of commodities including oil and boost inventories of strategic raw materials to take advantage of weak prices, the nation’s economic planner said in March. The country is also buying commodities as it attempts to diversify investments away from Treasuries. China boosted purchases of U.S. debt by 46 percent to a record last year. Copper imports by China, the world’s largest consumer, rose to a record for a third month in April, according to the customs office. Aluminum purchases also jumped to a record. The dollar traded at $1.3650 per euro at 6:10 a.m. in Tokyo, after dropping 0.5 percent yesterday and touching $1.3707, the weakest level since March 23. U.S. crude stockpiles are at the highest since 1990 and probably gained 1 million barrels last week, according to the median of 15 responses in a Bloomberg News survey. Supplies rose to 375.3 million barrels in the week ended May 1, the highest since September 1990, the Energy Department said. The industry-funded American Petroleum Institute reported yesterday that oil supplies fell 3.13 million barrels to 370.7 million last week. The price of Nymex oil for delivery in July is 86 cents a barrel higher than for June, down from a 91-cent premium yesterday and the narrowest since March 19. This structure, in which the future month’s price is higher than for the one before it, is known as contango and allows buyers to profit from storing oil. A narrowing spread reduces the incentive to stockpile crude oil. Oil prices are up 33 percent this year, supported by record production cuts announced by the Organization of Petroleum Exporting Countries. OPEC output averaged 27.58 million barrels a day last month, down 75,000 from March, according to a Bloomberg News survey. It was the ninth straight monthly production decline. The 11 OPEC members with quotas, all except Iraq, pumped 25.255 million barrels a day last month, 410,000 more than their target of 24.845 million. OPEC ministers are scheduled to discuss output levels at a May 28 gathering in Vienna. “It’s too early to say” what decision the group will make at its next meeting, Qatari Oil Minister Abdullah bin Hamad Al- Attiyah said at the opening of the South Hook liquefied natural gas terminal in Wales. Analysts were split over whether gasoline stockpiles rose or fell last week. Supplies of distillate fuel, a category that includes heating oil and diesel, probably increased 1.25 million barrels, according to the Bloomberg News survey. The department is scheduled to release its weekly petroleum inventory report today at 10:30 a.m. in Washington. Gasoline futures for June delivery dropped 1.23 cents, or 0.7 percent, to settle at $1.6679 a gallon in New York. Heating oil rose 0.61 cent, or 0.4 percent, to end the session at $1.507 a gallon. Brent crude oil for June settlement rose 46 cents, or 0.8 percent, to end the session at $57.94 a barrel on London’s ICE Futures Europe exchange. May 12 (Bloomberg) -- Soybean prices rose for the third straight session as declining South American production boosts demand for shrinking U.S. supplies. Inventories on Aug. 31, before the next harvest, will total 130 million bushels, down from 165 million estimated in April and 205 million bushels on hand a year earlier, the U.S. Department of Agriculture said today. U.S. inventories represent 4.3 percent of projected use, the tightest supply ratio since 1966, USDA data show. “It’s a very tight inventory,” said Jim Gerlach, the president of A/C Trading Inc. in Fowler, Indiana. “There’s more upside” until prices rise high enough to slow demand, Gerlach said. Soybean futures for July delivery rose 1.5 cents, or 0.1 percent, to $11.175 a bushel on the Chicago Board of Trade. On May 7, the price reached $11.31, the highest for a most-active contract since Sept. 29. Estimated global production this year will fall to 212.8 million metric tons, compared with 218.8 million tons forecast a month ago and a record 221.1 million tons harvested last year, because of smaller crops in South America, the USDA said. Global consumption this year is forecast at 222.5 million tons, compared with 225.4 million tons projected in April. Inventories on Oct. 1, before the Northern Hemisphere harvest, will fall to 42.6 million tons from 45.8 million estimated in April and from 53.1 million tons last year, the USDA said. The USDA raised its estimate of Chinese imports from all sources in the marketing year that ends Sept. 30 to a record 37.5 million tons, from 36 million forecast in April. The Chinese government this month said it wants to build a reserve inventory of 7.5 million tons of soybeans, or almost half of the 16 million tons harvested in September and October. U.S. exporters reported sales of 654,400 metric tons of soybeans in the week ended April 30, with China purchasing 30 percent of the total, the USDA said May 7. Since Sept. 1, U.S. sales to China have increased 41 percent from a year earlier, according to the department. “China is squeezing the market to build strategic reserves,” Gerlach said. “Until there is confirmation of a slowdown in Chinese buying, prices will continue to rise” toward a target of $12.23 a bushel, Gerlach said. Soybeans are the second-biggest U.S. crop, valued in 2008 at $27.4 billion, government figures show. Corn is the largest at $47.4 billion. May 13 (Bloomberg) -- The dollar fell to a two-week low against the yen and declined versus the euro after a Financial Times article said the U.S. AAA credit rating may be at risk. The dollar dropped for a fourth day versus the yen after the former U.S. comptroller general David Walker wrote in the FT that the U.S. government should create a “fiscal future commission” to rein in the country’s finances because its credit rating may be cut. The dollar fell to 96.21 yen as of 9:09 a.m. in Tokyo from 96.45 yen yesterday in New York. It earlier touched 95.99, the lowest since April 28. The greenback declined to $1.3688 per euro from $1.3648 yesterday when it touched $1.3707, the weakest since March 23. The euro was at 131.68 yen from 131.63 yen. The Dollar Index, which the ICE uses to track the U.S. currency against the euro, yen, pound, Swiss franc, Canadian dollar and Swedish krona, traded at 82.093 after falling to 82 yesterday, the lowest since Jan. 9. FKLI May futures contract rebound 10.5 point higher to close at 1025.5 as compare to previous trading session with total 11,323 lots traded in the market. Wild trading days for FKLI price movement due to mix regional indices during trading sessions. Technically, FKLI seems supported above 100 – day and 80 – day exponential moving average in the hourly charts and closed around 61.8% Fibonacci figures at 1026 regions. We expect FKLI would continue to trade lower in the coming trading session provided resistance levels at 1030 and 1037 regions were not violated. Traders were advice to hold short position once support levels at 1020 and 1010 regions were breach. FCPO 3rd month July Futures contract rebound RM65 higher to close at RM2725 as compare to previous trading session with 8,374 lots traded in the market. CPO price was traded higher due to strong soybean oil and crude oil electronic trading despite were settled lower on overnight trade. Technically, CPO seems support above 100 – day and 80 – day exponential moving average in the 15minutes price chart and traded within the RM2730 and RM2680 range. We expect CPO price would trade lower in the coming trading session provided resistance levels at RM2730 and RM2755 were not violated. Traders were advice to hold short position in the coming trading session while be cautious around support levels at RM2700 and RM2655 regions. MUMBAI, May 12 (Reuters) - Indian soybean and soyoil futures rose in early trade on lower soybean output estimates in the year ending September 2009 and tracking a firm Malaysian palm oil, analysts said. At 10:10 a.m, the June soybean contract NSBM9 on the National Commodity and Derivatives Exchange rose 0.52 percent to 2,714 rupees per 100 kg. The June soyoil contract NSOM9 was at 508.85 rupees per 10 kg, up 0.28 percent. India's soybean output may drop to 8.2 million tonnes in the year ending Sept 2009, down more than a fifth from early estimates, as lower rainfall trimmed yields in producing areas, a top trade official said. At 10:00 a.m. the benchmark July palm oil futures KPOc3 on Bursa Malaysia Derivatives Exchange was up 1.05 percent at 2,688 ringgit a tonne. Soyoil, an edible oil, is used as a substitute for palm oil. Their prices often move in tandem. May 12 (Bloomberg) -- Crude oil fell for a second day after U.S. equities declined from a four-month high and on expectations that inventories will increase for a 10th week. Oil followed equity markets lower, reversing gains made last week after the U.S. economy lost fewer jobs than expected. The Standard & Poor’s 500 Index declined 2.2 percent while the Dow Jones Industrial Average dropped 1.8 percent. Crude oil for June delivery fell as much as 44 cents to $58.06 a barrel and was at $58.23 on the New York Mercantile Exchange at 10:00 a.m. in Sydney. Yesterday, the contract dropped as much as $1.85, or 3.2 percent, to $56.78 a barrel before settling at $58.50. Prices are up 31 percent this year. U.S. stockpiles probably rose for a 10th week, gaining 1 million barrels last week, according to the median of 12 responses in a Bloomberg News survey. They climbed to 375.3 million barrels during the week ended May 1, according to the Energy Department. “Unless we see some really deteriorating numbers out of the U.S. in the way of economic data, I don’t see the oil price coming back further than the current levels,” Pervan said. Saudi Arabian Oil Co., the world’s biggest state oil company, maintained cuts in contracted supplies of crude oil to Asia in June, refinery officials said. The Dhahran, Saudi Arabia-based producer will keep in place reductions in shipments to refiners of between 10 percent and 15 percent from levels agreed under annual contracts, according to officials at processors in China, Japan, Taiwan and South Korea who received notices from the company. The officials asked to remain anonymous, citing confidentiality agreements. This marks the seventh straight month of output cuts by Saudi Aramco. The Organization of Petroleum Exporting Countries agreed at three meetings last year that the 11 members with quotas would reduce production by 4.2 million barrels a day. Gasoline futures for July delivery are poised to rise above $1.70 a gallon, according to technical analysis by Newedge USA LLC. “As long as gasoline remains above $1.635, it is positioned to challenge significant resistance around $1.70,” Veronique Lashinkski, a senior research analyst for Newedge USA LLC in Chicago, said in a report on May 8. Gasoline futures for June delivery dropped 2.53 cents, or 1.5 percent, to settle at $1.6802 a gallon in New York. Gasoline supplies probably rose 250,000 barrels from 212.4 million the prior week, according to the Bloomberg News survey of analysts. Stockpiles of distillate fuel, a category that includes heating oil and diesel, probably increased 1.03 million barrels from 146.5 million. Total daily fuel demand averaged 18.2 million barrels in the four weeks ended May 1, down 7.9 percent from a year earlier, the department said. It was the lowest consumption level for a four-week period since May 1999. Oil surged to a record $147.27 a barrel on July 11 as investors purchased commodities amid concern that rising demand in China and other emerging economies would outpace production. Chinese consumer prices fell 1.5 percent in April from a year earlier, the nation’s statistics bureau said in Beijing yesterday. China is the world’s second-biggest oil consumer. Brent crude oil for June settlement rose 0.5 percent to $57.40 a barrel at 10:12 a.m. Sydney time. It declined 66 cents, or 1.1 percent, to end the session at $57.48 a barrel on London’s ICE Futures Europe exchange yesterday. May 11 (Bloomberg) -- Gold declined in New York on speculation that investment demand will drop as more signs emerge that the global recession may have touched bottom. Silver also slipped. Policy makers see “encouraging” signs of a recovery, European Central Bank President Jean-Claude Trichet said after a meeting of central bankers. U.S. consumer sentiment rose in April by the most in more than two years. German factory orders gained for the first time in seven months in March. The dollar climbed as much as 0.6 percent against the euro. Gold futures for June delivery fell $1.40, or 0.2 percent, to $913.50 an ounce on the New York Mercantile Exchange’s Comex division, after dropping as much as 0.7 percent earlier. The most-active contract rose 3 percent last week, and may resume climbing in the next few days, said MF Global’s Tom Pawlicki. Holdings in the SPDR Gold Trust, the biggest exchange- traded fund backed by bullion, reached a record of almost 1,128 metric tons last month and has decreased 2.1 percent since then. U.S. stocks retreated from a four-month high after the Standard & Poor’s 500 Index traded at the most expensive level in seven months. The S&P tumbled as much as 2.2 percent before paring losses. Some investors sell gold to raise cash when they expect higher returns in other markets, such as equities and currencies. “The safe-haven play is becoming less relevant at the moment, largely because we are beginning to see more positive economic signals,” said David Wilson, an analyst at Societe Generale in London. Crude-oil futures, which jumped 10 percent last week, slid as much as 3.2 percent in New York. Oil fell after asset seizures in Venezuela, the biggest supplier to the Americas. On May 8, Venezuelan agencies completed a seizure of oil- services company assets as President Hugo Chavez said private companies were no longer needed in the country’s oilfields. “We’re going to bury capitalism in Venezuela,” he said. In Pakistan, the government said the army killed about 700 insurgents in the past two weeks in the northwest region, where Taliban militants asserted control earlier this year. The government said 20 soldiers died in the fighting. The casualty figures couldn’t be independently verified. Silver futures for July delivery fell 4.5 cents, or 0.3 percent, to $13.91 an ounce in New York. The most-active contract jumped 12 percent last week, the biggest weekly gain since Sept. 19. Gold still has advanced 3.3 percent this year, underperforming silver, which has gained 23 percent. May 11 (Bloomberg) -- Corn and soybeans fell on speculation that prices climbed too fast, outpacing recession-depressed demand for raw materials. The Standard & Poor’s 500 Index of equities fell as much as 2.2 percent and crude oil dropped from a six-month high after HSBC Holdings Plc Chief Executive Officer Michael Geoghegan said 2009 will be a “tough” year amid a still-deteriorating economy and rising bad loans. Before today, corn jumped 20 percent since March 2 and soybeans surged 32 percent on increased exports. Corn futures for July delivery fell 2.25 cents, or 0.5 percent, to $4.1875 a bushel at 10:44 a.m. on the Chicago Board of Trade. Before today, the most-active contract gained 4.3 percent this month. Soybean futures for July delivery fell 7 cents, or 0.6 percent, to $11.045 a bushel in Chicago. The price rose 1.9 percent last week, touching a seven-month high of $11.31 on May 7. Soybean sales from Sept. 1 to April 30 rose 12 percent to 32.444 million metric tons compared with the same period a year earlier, while corn sales slid 33 percent, U.S. Department of Agriculture data show. Futures trading will be subdued before this afternoon’s weekly update on crop-planting by the USDA, Riley said. Wet, cold weather has interfered with seeding during the past month. Riley said traders also are reluctant to hold large positions before tomorrow’s release of the USDA’s first forecasts for U.S. and world output and demand for the 2009-2010 marketing year. About 33 percent of the U.S. corn crop, the world’s biggest, was planted as of May 3, USDA reported last week. That compares with an average of 50 percent at this time from 2004 to 2008. Soybean planting was 6 percent complete on May 3, compared with the five-year average of 11 percent. Corn is the biggest U.S. crop, valued at a record $47.4 billion in 2008, with soybeans in second place at a record $27.4 billion, government figures show. May 12 (Bloomberg) -- The yen and dollar may extend gains versus the euro on speculation a decline in stocks will reduce demand for higher-yielding assets. The euro, which rose the most against the dollar in almost two months on May 8, dropped yesterday after its 14-day relative strength index approached 70, signaling a change in direction may be imminent. Australian’s dollar may add to losses from its highest level in seven months against the U.S. currency on concern a decline in crude oil and commodity prices will weaken demand for the currency. The yen traded at 132.51 per euro as of 8:16 a.m. in Tokyo from 132.40 in New York yesterday when it touched 134.82, the weakest level since April 7. The dollar was at $1.3590 per euro from $1.3582. It slid to $1.3668 yesterday, the lowest since March 24. The U.S. currency bought 97.51 yen from 97.48. Canada’s currency traded at C$1.1648 per U.S. dollar following a 1.5 percent decline against the greenback yesterday when the Standard & Poor’s 500 Index fell 2.2 percent. The loonie reached C$1.1477 yesterday, the strongest since Nov. 5. The Canadian dollar rose 10 percent in the past two months as evidence the worst of the global recession may be over encouraged investors to buy currencies of commodity producers that stand to benefit from a recovery. Commodities such as oil and gold account for half of Canada’s exports. Australia’s dollar, which also benefits from a recovery of global demand because of heavy reliance on shipments of resource and commodity products, was at 75.94 U.S. cents from 75.86 cents yesterday when it dropped 1.3 percent. The European currency’s 14-day relative strength index was at 62.92 yesterday, compared with 64.72 at the end of last week. The last time the index was in the middle 60s was after the Fed’s announcement in March. FKLI May futures contract plunge 17 point lower to close at 1015 as compare to previous trading session with total 8,274 lots traded in the market. FKLI was traded lower due to Dow Jones electronic and regional indices sudden drop despite were trading positive during morning session. Technically, FKLI hourly chart shows price manage to break down from the rising despite much choppy trading above the trend line. 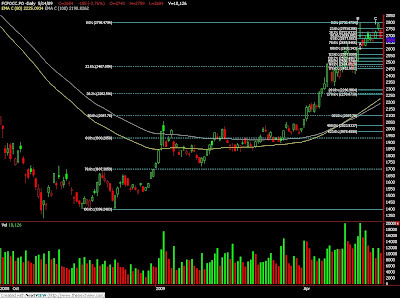 We expect FKLI would trade lower in the coming trading session while support levels seen at 998.5 and 950 regions. 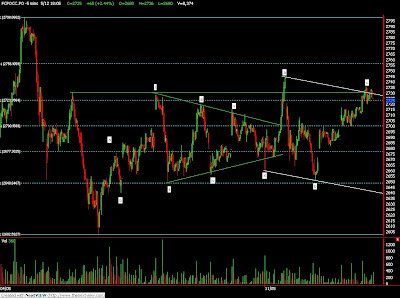 Traders were advice to hold short position in the coming trading session with resistance seen at 1022 and 1037 regions. FCPO 3rd month July Futures contract close RM25 lower at RM2660 as compare to previous trading session with 11,741 lots traded in the market. CPO price was traded in a wide range during the trading session as soybean oil and crude oil were also traded wild. 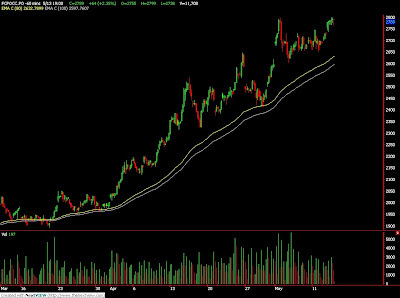 Technically, CPO seems manage to breach 100 – days and 80 – days moving average in the 15minutes price chart after 4 consecutive tests on the moving average during previous trading session. We expect CPO price would trade lower in the coming trading session while supports were seen at RM2624 and RM2591. Traders were advice to hold short position in the coming trading session while resistance levels were seen at RM2710 and RM2755 regions. May 11 (Bloomberg) -- Palm oil, used in everything from Twix candy to diesel fuel, may be poised to end its fastest rally in almost seven years and drop 25 percent as the world’s biggest growers reap record harvests. Indonesia and Malaysia, the top two producers, may boost world supplies by 5 percent this year, according to government and producer estimates. India, the second-biggest buyer, will probably slow imports because of rising stockpiles, Citigroup Inc. said. The world’s most-used cooking oil, which is trading at 2,743 ringgit in Kuala Lumpur today, may average 2,100 ringgit ($600) a ton in 2009, Deutsche Bank AG analysts Su-Yin Teoh and Rachman Koeswanto said. “We expect palm oil to weaken,” said Sunaina Dhanuka, an analyst at Macquarie Group Ltd. in Kuala Lumpur. “Production is likely to recover in coming months as weather conditions improve and exports are likely to slow down to exhaust the current stockpiles.” Dhanuka forecast an average price of 1,850 ringgit a metric ton this year in a May 5 report. About $33 billion worth of the oil, squeezed from bunches of plum-sized fruit, is consumed each year for frying and in margarine, based on estimates from the U.S. Department of Agriculture and the current price. The European Union agreed last year that at least 10 percent of the energy used in road and rail transport in 2020 will come from renewable sources, such as vegetable oils. Palm oil is the second-best commodity investment this year, with a gain of 62 percent. Only gasoline’s 67 percent jump has been larger among the biggest exchange-traded commodities, according to data compiled by Bloomberg. The cooking oil has climbed 97 percent from a three-year low on Oct. 24, its fastest gain since at least June 2002, according to Bloomberg data. A drop to the level predicted by Macquarie would cut Malaysia’s export revenue by $4.9 billion, assuming no change from last year’s volume. Net income of Kuala Lumpur-based Sime Darby Bhd., the world’s biggest producer by market value, may drop 38 percent to 2.18 billion ringgit in the year to June 30, according to the median of 15 estimates compiled by Bloomberg. Prices advanced this year as declining output in Malaysia, the second-biggest grower, caused inventories to shrink 43 percent from a record in November to 1.29 million tons in April, the lowest since June 2007, Malaysian Palm Oil Board data show. Supplies are likely to climb as palm trees enter their most productive season, said Citigroup analysts Penny Yaw and Margarett Go. Palms in Indonesia and Malaysia, which account for 90 percent of world output, typically yield 55 percent of their oil in the second half. Malaysia reaped 9.5 million tons from July to December last year, up 16 percent from the first half, according to board data. Malaysia’s crop will total 18.3 million tons this year, Minister of Plantation Industries and Commodities Peter Chin said April 7, up 3.4 percent from 2008. The harvest in Indonesia may rise 6.8 percent to 20.5 million tons, said Susanto, the marketing head of the Indonesian Palm Oil Association, on May 8. “I’m still fundamentally bearish,” said James Fry, managing director of UK-based LMC International Ltd., a consultant to the agricultural industry. “Prices are 300 ringgit to 400 ringgit too high,” he said by phone May 6. The highest price in a year relative to soybean oil, its main competitor, is also encouraging expectations for lower prices. The two commodities are the world’s most consumed vegetable oils and can be interchangeable for frying, food preparation and fuel. Soybean oil was almost twice the price of palm in October and is now only 10 percent higher, according to data compiled by Bloomberg. Futures show palm oil declining 9.4 percent by November and soybean oil rising 2.7 percent by December. Supplies of soybean oil were limited after a drought in Argentina cut soybean production by 27 percent. U.S. soybean inventories will fall 20 percent from a year earlier to 165 million bushels by Aug. 31, a five-year low, the USDA said. Demand for palm oil has risen so much that the market is now in so-called backwardation, where prices for prompt delivery are more expensive than those later in the year. India increased imports of crude palm oil 40 percent to 2.26 million tons in the five months to March 31 from the year ago. “Imports will remain high in the coming months as there’s going to be no local supplies,” said B.V. Mehta, executive director of the Solvent Extractors’ Association in Mumbai. Vegetable oil purchases may rise 43 percent to 8 million tons in the year to Oct. 31 from the previous year, he said May 8. Buyers built record inventories in India in anticipation of higher import duties in June, a signal that purchases may slow, Citigroup’s Yaw and Go said in a report April 21. China, the biggest importer, may also curb purchases. The government warned against shipping “excessive” amounts of oilseeds last month because stockpiles were rising and shipments were set to jump. The country boosted soybean imports 30 percent in the first quarter to 10.2 million tons, according to customs. Inbound palm oil shipments gained 9.4 percent to 1.37 million. Supplies may increase after the Northern Hemisphere harvests this autumn. U.S. farmers plan to grow a record 76 million acres of soybeans this year, the U.S. Department of Agriculture said March 31. Soybeans climbed 29 percent in the past two months, compared with a 15 percent gain in corn. That may convince growers to plant more soybeans instead of corn, Citigroup said. About 10 percent of palm oil is used outside of foodmaking, according to the American Palm Oil Council. Prices may face more pressure because demand for biodiesel is waning after the 60 percent collapse in crude prices from last year’s record. Only subsidies make fuels viable at these prices, according to Credit Suisse Group AG. Crude climbed 10 percent last week in New York. Demand is suffering because of the global recession. U.S. soybean use fell 7.2 percent in March as domestic and overseas sales declined, the government said. Processors including Bunge Ltd. converted 4.34 million short tons of soybeans into oil and livestock feed, down from 4.679 million tons a year earlier. The global economy is in a “severe” recession with “worrisome parallels” to the Great Depression, according to the International Monetary Fund. The Washington-based lender predicts the economy will shrink as much as 1 percent this year. Palm oil this year will average 2,100 ringgit a ton, according to the median forecast in a Bloomberg News survey of eight banks, with predictions ranging from 2,500 ringgit to 1,850 ringgit. The most active contract on the Malaysia Derivatives Exchange averaged 2,067 ringgit so far this year. Prices are “unsustainable” and will probably drop by 20 percent to 25 percent, said Deutsche Bank analysts Su-Yin and Koeswanto in a report May 1. Next year, prices will decline again to average 1,900 ringgit a ton, they said. “It’s not economical to buy palm oil,” said Koeswanto by phone May 7. MUMBAI, May 11 (Reuters) - Indian soybean and soyoil futures fell on early Monday tracking weakness on Chicago Board of Trade (CBOT) and as traders await a U.S. Department of Agriculture report on soybean demand and supply on Tuesday, analysts said. However, firm Malaysian palm oil limited the losses, they added. At 10:32 a.m, the June soybean contract NSBM9 on the National Commodity and Derivatives Exchange fell 0.86 percent to 2,715 rupees per 100 kg. The June soyoil contract NSOM9 was at 510.65 rupees per 10 kg, down 0.29 percent. July soybean futures SN9 and July soyoil futures BON9 were down during the electronic trade on CBOT. At 10:00 a.m. the benchmark July palm oil futures KPOc3 on Bursa Malaysia Derivatives Exchange rose 2.16 percent to 2,743 ringgit a tonne. May 11 (Bloomberg) -- Crude oil fell from a six-month high on speculation last week’s 10 percent advance won’t be sustained as global supplies increase. Exports from Iraq’s Kurdistan region will begin June 1 after the state oil ministry agreed to “expedite” shipments, the provincial government said on its Web site yesterday. Venezuela, OPEC’s fifth-largest producer, seized the assets of 60 oil-field service companies on May 8 to restore operations shut over contract disputes. Crude oil for June delivery fell as much as 52 cents, or 0.9 percent, to $58.11 a barrel in after-hours electronic trading on the New York Mercantile Exchange. It was at $58.40 at 8:30 a.m. in Singapore. The contract rose 3.4 percent to $58.63 a barrel on May 8, the highest settlement since Nov. 11, as slowing job losses in the U.S. increased investor confidence and a drop in the dollar boosted the appeal of commodity investments. Brent crude oil for June settlement fell 23 cents, or 0.4 percent, to $57.91 a barrel on London’s ICE Futures Europe exchange. It rose 3 percent to $58.14 on May 8, the highest since Nov. 10. Last week’s jobs report in the U.S., the world’s largest oil consumer, is adding to investor confidence that the worst of the recession there may be over, boosting demand expectations, Hassall said. Ongoing weakness in the dollar will support commodities and oil may resume its rally if U.S. summer fuel demand is sufficient to start drawing down stockpiles there, he said. Hedge-fund managers and other large speculators changed their bets on the direction of oil prices for a second time last week, according to U.S. Commodity Futures Trading Commission data. Speculative short positions, or bets prices will fall, outnumbered long positions by 11,285 contracts on the New York Mercantile Exchange on May 5, the commission said May 8. A week earlier, traders had bet on rising prices. New York oil futures plunged to a four-year low of $32.40 on Dec. 19 as global recession slashed demand and producers cut production to slow rising stockpiles. Prices have gained 39 percent in the past two months as measures to restore global credit markets lifted global equity markets. The Organization of Petroleum Exporting Countries will review its output levels on May 28. Iran, the group’s second- largest member, will seek a price of $70 a barrel, the nation’s oil ministry said May 9, citing OPEC governor, Mohammad Ali Khatibi. “I don’t believe OPEC is going to cut again, especially with what’s happened to prices the last couple of weeks,” Commodity Warrants’ Hassall said. FKLI May futures contract close at 1032; unchanged as compare to previous trading session with total 9,582 lots traded in the market. 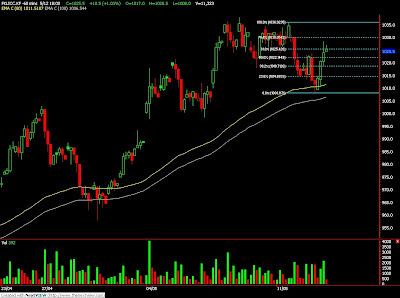 FKLI was traded sideways near the top side for the 2nd trading session as waiting for fresh leads to direction movement. Technically, FKLI seems supported above rising wedge trend line at 1018 region in the hourly price chart. We expect FKLI would surge in the coming trading session with resistance levels at 1038 and 1050 regions. Traders were advice to hold short position provided price fails to breach the resistance levels while rising wedge confirm it’s formation if support levels at 1018 and 1000 were breach. FCPO 3rd month July Futures contract close marginally RM5 higher at RM2685 as compare to previous trading session with 10,350 lots traded in the market. CPO price was traded sideways during trading session despite of soybean oil and crude oil price wild movement. Technically, CPO price seem traded sideways in the 5 minute chart and formed at symmetric triangle within RM2670 and RM2720 range. 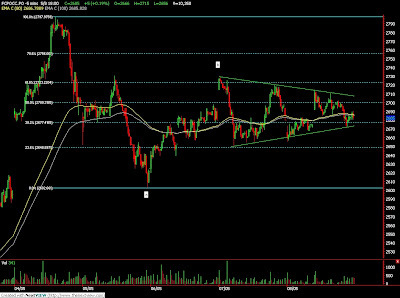 We expect CPO price would break from the triangle formation in the coming trading session. Traders were advice to trade accordingly towards the direction once trading price were break out from the sideways range. 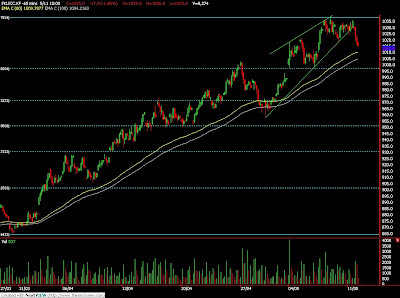 Supports were seen at RM2670 and RM2655 while resistance levels were seen at RM2730 and RM2755 regions.